After the decision of the European Court of Justice in the Placanica case and the recent tender that allowed online and land-based gambling operators to enter the Italian market, all eyes are now turning to Italy and its role in the liberalisation of European gambling markets. 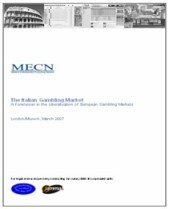 The study and survey analyses the Italian gambling market in detail and includes the results of a survey MECN conducted among more than 70 international operators who offered their unique insights and assessments. Another phase of liberalisation is expected in the near future - Two-thirds of the experts surveyed expect another phase of liberalisation in the near future that will go even further than the steps planned for 2007. Growing relevance of foreign operators - A large majority of the experts believe that by 2010 international operators, such as Ladbrokes and Intralot, will capture a relevant share of the gambling market. Growth potential, especially for retail betting and interactive gambling - Overall, Italy’s gambling market is expected to grow to Euro 61 billion (turnover) by 2010 (+64%). By 2010, the retail betting market is expected to grow to ca. Euro 14 billion, which is about 200% its current size (CAGR of 32%). Another growth driver will be interactive gambling, which is expected to reach ca. Euro 3.7 billion by 2010, a growth of ca. 240% over the current level (CAGR of 40%).